I am currently listening to Alanis Morissette like it's 1996. Back in 1996 I was 14 turning 15. In year nine. I got red and black Doc Martens for my 15th birthday. I wore them with denim mini skirts. I still wear my red and black Docs. I secretly read Dolly magazine, I secretly watched Heartbreak High and I secretly listened to Jagged Little Pill. Until my parents said I couldn't. Because they heard the lyrics to You Oughta Know. I have an admission. I secretly continued. It's ok, Mum and Dad. I'm absolutely unaffected. Even with secretly continuing to do all these forbidden activities. I haven't taken drugs, never smoked a cigarette, haven't slept with anyone I wasn't going out with, the only extra piercing I had was the cartilage on the top of my left ear but the doctor told me to take it out, the only subject I failed was accounting but you knew I wasn't good at maths before I started listening to Alanis, and I've only been hideously drunk in a public place once. Or maybe twice. Listening to Alanis Morissette in secret didn't make me go off the rails. But I wouldn't let my kids listen to the music of today. Last night I thought I'd give Alanis a spin again. I downloaded a few songs I already have on CD. It was too cold to get out of bed. After I said Supposed Former Infatuation Junkie was a difficult second album, I wondered if I was being unfair. I think I was correct the first time, bar a few songs. Jagged Little Pill is the music I've been missing. In 1996 I bought Jagged Little Pill from Big W after I heard all the hype of Alanis at the Grammy Awards. I played the album on my trusty boombox but the CD was scratched. It was also not to the tastes of my precious ears - it was too heavy (geez, this excuse is becoming wimpy) and I didn't really want the CD anymore. I don't think I gave it a proper go. The hype of the Grammys was short lived for me. So Mum returned it and got a far more suitable CD - Joan Osborne's album featuring One of Us. You know, 'yeah, yeah, God is good...yeah yeah God is great...' I am not sure why I ever liked this song. Perhaps I thought it was deep. I am pretty sure that in year nine, I had long ceased believing in God. Joan and Alanis were the two rock chicks fighting it out on the charts back in '96. I soon found out that while Alanis' music was too heavy, Joan's was BORING. NEXT! So I do believe this CD was returned, too. I can't recall ever playing it again. (Note - this was back in the day of relaxed exchange policies for CDs, and DVDs were just a twinkle in God's eye...) But thank GOD for YouTube for the times I get a hankering to hear One of Us again. God is great for inventing YouTube. Anyhow, so then I was watching Rage one day and I saw this video clip. It confirmed that I didn't give Jagged Little Pill a proper go. I thought it was pretty amazing to see four Alanises in the car at once. I particularly like the multiple plaited Alanis. I once had a boyfriend with multiple plaits. Perhaps it was foresight. So after I recorded Rage and replayed the Ironic video 472729 times, I repurchased Jagged Little Pill. I read in TV Hits (a magazine that I was allowed to read) that Alanis was on You Can't Do That On Television. I used to watch that when I was five! I don't recall her though. Thank God for Joan Osborne making God one of us to enable the creation of YouTube so we can relive the magic of this show. I can play Jagged Little Pill now, 14 years after its release, and still recite every word. Like this. 'Do I stress you out? My sweater's on backwards and inside out and you say how-ow-ow-ow apprrrrrrooooppriate'. Her lyrics were something I related to. And I still do. Striving to achieve, to prove yourself, is a difficult and often endless thing. My favourite lyrics were to Forgiven. Unlike Joan Osborne's shallow (in hindsight) lyrics to One of Us, Forgiven made me think of the impact of religion and the fears it creates in some people. There was an assignment for English in year 11 where we had to bring in some influential song lyrics and the song, and discuss our interpretations. Students brought in U2's Pride, Pearl Jam's Jeremy and the Beatles' I am Walrus. I really wanted to bring in Forgiven, but I chose an obscure song from the 60s about the environment. I still think about that lesson when I listen to Forgiven and wish I had have taken it in and done an analysis. I love the depth of Jagged Little Pill. That many songs are dark. Some are funny. Some make me blush. And most are sad. But all are memorable. She may not be in the same league as Stevie Nicks, but to me, Alanis's Jagged Little Pill is an album I've carried with me for half of my life now, and return to with pleasure. I only wish I could warm to her subsequent albums! Oh, I still listen to Jagged Little Pill, as well! Although, I didn't own it 'till I was twenty. I doubt my parents would've been impressed either ;). Such good stuff. Great post seeing as it's Canada day, too! I love this album, going to dig this out right now - think I've got a copy in my car! I love You Oughta Know - so angry and cool, I used to love singing this at the top of my lungs, pretending to be all tough! I bought the acoustic version when it came out, and wrote a blog post about the occasion back in 2005. This post reminded me of that post as it recounted my mothers reaction to thae Jagged little Pill CD. Nawww I love your trips down memory lane! 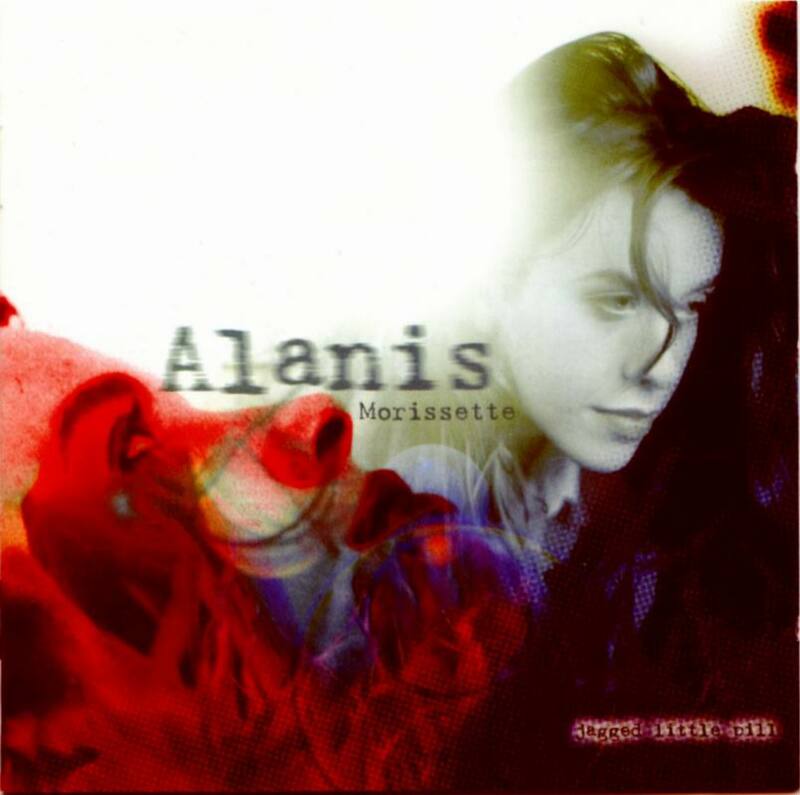 Always a good album - love a strum on the guitar to ol' Alanis! !